Kinesio Tape Columbia: What Is This Unique Method of Healing? What Is Kinesio Tape, and How Does It Work? If you’ve been to a gym, you might have seen some of the people there wearing unique bandages. It’s often used by those who play a professional sport or who are very serious about working out. While it might at first look like it would restrict movement, the people wearing seem to have no problems going about their workout. What you’re seeing is most likely Kinesio tape and a similar procedure called Kinesio floss. If you’re curious about why people head to a chiropractor in order to have this tape applied (but are too afraid to ask! ), keep reading to learn more about this procedure you can get done at a chiropractic clinic. Human kinesiology is simply the scientific study of the ways in which the body moves. This includes biomechanics, orthopedics, physical therapy, occupational therapy, and exercise. Kinesio tape was invented by Dr. Kenzo Kase in the late 1970s. Kase was a chiropractor and acupuncturist who was looking for a way to relieve pressure on some parts of the body while putting that pressure on others. He developed long cotton bandages with medical-grade adhesive on one side. They’re hypoallergenic and can be used by just about anyone young or old. The Kinesio tape is waterproof and can be worn during strenuous activity, and it can stay in place for days at a time. Kinesio tape can have different effects on muscles. In one location it might stimulate some muscles and make them work harder. Placed elsewhere, the tape can give certain muscles a break so that they will have time to heal. The most common reason that people are interested in it is to reduce inflammation. When you reduce pressure on an area, it decreases inflammation and swelling, giving the body time to heal. Not only can it increase blood flow, but it can also help with lymphatic drainage. You might think “I’ll just have my spouse put my Kinesio tape on.” Well, unless your spouse has extensive medical training on the muscular and skeletal systems of the body, they could be doing more harm than good. It’s important that the person who applies the tape know how putting stress on one part of the body might affect another part; improper application could actually have the opposite of the intended effect. It’s best to go to a chiropractic clinic in order to make sure it’s applied correctly and in the right place. Many professional athletes will have Kinesio taping done, as will people who are serious about getting back to their workouts as quickly as possible. And while it’s true that those are the Kinesio bandages that you see most often, it’s usually because those are the people who are wearing the most revealing clothes! The truth is, Kinesio tape can be (and is) used by every type of person, whether they’re recovering from an injury or are looking to increase their lymphatic drainage. Most people simply cover it up pretty well so that you never see it! 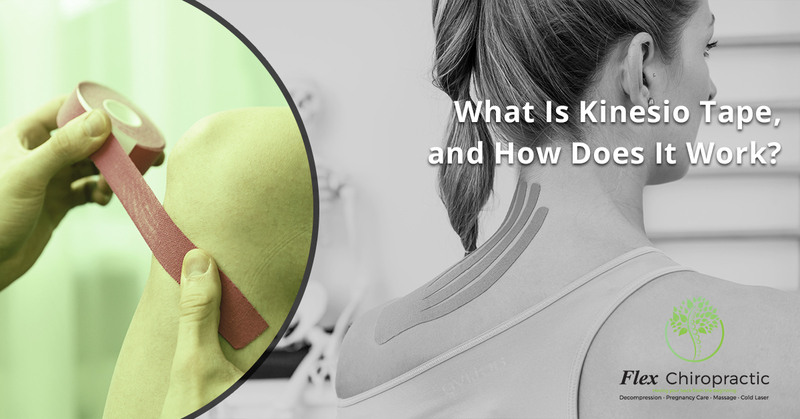 Is Kinesio tape right for you? Next time you’re at you your local chiropractor in Columbia or Lexington, why not ask about it? It might be just what you’re looking for!